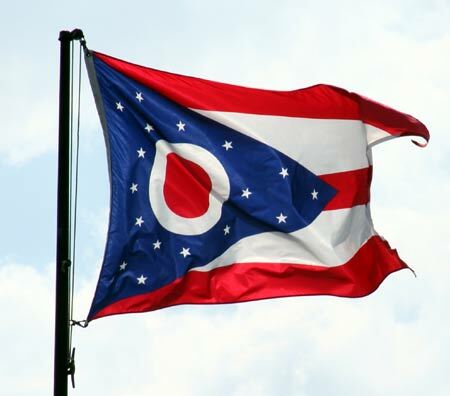 It took Ohio almost 100 years to come up with its own flag and then once it was adopted as the state flag, we learned it really wasn't a flag, it was something called a burgee and we are the only state in the union to have one. Some other odd things about the flag is that it was first patented by its creator. Then, the very first time it flew, it was unfurled in New York state! The event for which this emblem of the state flew for the first time, was also the event at which one of Ohio's favorite sons was struck down by an assassin's bullet, permanently adding his name to a growing list of assassinated presidents. Ohio's flag was adopted by the Ohio state legislature in 1902 and the flag's shape is unique among the other 49 sates. The flag is called a burgee, more precisely a swallow tail burgee. Burgee's are more commonly associated with boating and yachting. But why a burgee? Why not a regular old rectangular flag like the other 49 states fly? The answer lies with its inventor, John Eisemann. In 1900 architect, John Eisemann was the winning bidder for designing the Ohio Building for the 1901 Pan-American Exposition. That particular exposition would be Buffalo, New York for the 1901 Pan-American Exposition. Realizing that the state did not have an official flag, Eisemann went about creating a special flag to fly over the Ohio Building. It's not clear whether Eisemann intended for it to be Ohio's flag or not. What he did want was something unique to fly over his building design. He even patented the flag. in Buffalo, New York and the Ohio State Building. The Ohio State Building was designed by John Eisemann. The building was described as a low, gracefully proportioned building, with wide verandas, classic in treatment. The Ohio state legislature adopted Eisemann's flag in 1902 and has been the official state flag ever since without any modifications. The colors of the state flag are the same as the Red White and Blue of the US Flag which are also the same colors of the Union Jack of the United Kingdom. Using these same colors symbolize that Ohio was an extension of the the original country. The 13 stars grouped about the circle represent the original states of the union and the 4 lone stars at the tip of the triangle symbolize Ohio was the 17th state admitted to the union. The large white circle represents the "O" in Ohio. Those are the most obvious symbolic elements of the flag. Having known more than a few architects, I doubt that the following symbolism were part of John Eisemann's thinking. But here it is: the large blue triangle represents Ohio's hills and valleys, the stripes represent roads and waterways. The white circle with its red center not only represents the "O" in Ohio, but also suggests Ohio's famous nickname: "The Buckeye State." I believe any right thinking person would realize that those associations are stretches of over-active imaginations. My take on the swallow tail may be off the deep end as well. The unique swallow tail could represent the distinct groups of early Ohio settlers that came into the new state. A line running roughly east to west through Columbus divided the state. Those south of this line were more often than not from Virginia or some of the other southern states. North of that imaginary line, and folks were more often than not, from the New England area. Over the years, those distinctions blurred, but it still has an effect on the character of the state and that's why Ohio is such a bell weather indicator on the political stage. Above is a copy of John Eisenmann's original design for the Ohio State Flag. Mr. Eisenmann's design received a patent issued by the United States Patent Office on July 23, 1901. Did you know that the current American flag was designed by Robert Heft who was living with his grandparents in Lancaster, Ohio. It was just before the admission of Alaska in 1958 to the Union and before Hawaii was admitted in 1959. The 17 year old Heft was in search of a class project when he thought of redesigning the American Flag in light of the recent addition of Alaska as a state. His teacher, Stanley Pratt, told Heft, that his design lacked originality and gave him a -B on the project. Pratt told him, he could improve that -B grade if he could get the US Congress to accept his flag design. Heft sent his flag to Walter Moeller, his Ohio Congressman. Moeller succeeded in having Heft's design adopted as the new United States flag on July 4, 1960. Heft's original flag has flown over the White House, every state capital building in the Union, and 88 United States embassies. The flag remains in Heft's possession, although many people and museums have offered to buy the flag, including one offer of $350,000. Heft's United States of America Flag design was the 27th official flag of the United States. Heft became a high school teacher and also served as mayor of Napoleon, Ohio for 28 years. Heft now travels across the country, giving speeches regarding the United States flag and his role in its design. Heft also has developed a 51 star flag just in case a new state joins the Union. 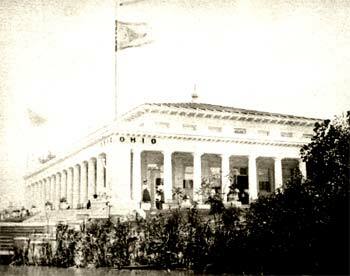 The first flying of the Ohio state flag was at the Buffalo New York's Pan-American Exposition. It was at this exposition that President William McKinley was assassinated. 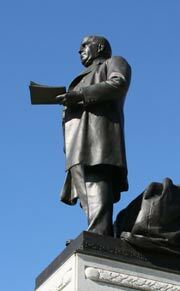 Ohio born McKinley was also a former governor of Ohio. Did this dramatic event seal the fate for John Eisemann's unique design? Perhaps. We do know that through a twist of fate, the assassination of President William McKinley, gave us a special scarlet carnation as the state flower. John Eisemann was an architect from Cleveland who created the Ohio flag in 1901, one of very few non-rectangular flags in the world. The shape of the flag of Ohio is a burgee. 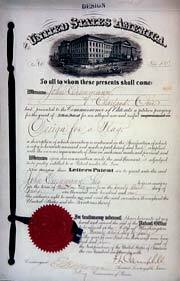 Eisemann applied for a patent for his design and received the patent on July 23, 1901. 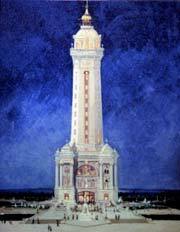 John Eisemann also submitted a design for the Perry Memorial on South Bass Island. However, his original design lost out to the design of architects Joseph H. Freelander and Alexander D. Seymour, Jr., of New York City. Eisenmann was awarded a $1,500 consolation prize. 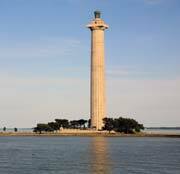 Eisemann's idea of placing the memorial on the isthmus on South Bass Island was regarded as the ideal site for the memorial which is where it now stands.